Patients born with Ehlers-Danlos syndrome often fight many for years for proper diagnosis, recognition, and treatment. Most patients wait more than a decade to obtain diagnosis. Their fight can be a difficult, tortuous road. Because of the multisystemic nature of many forms of Ehlers-Danlos, too many patients struggle for over a decade to obtain comprehensive diagnosis and treatment for their overall condition. As a result, many are not diagnosed until much later in life when damage to joints can be irreversible. We asked the Ehlers-Danlos community how many years it took to be diagnosed from the onset of their symptoms. Their answers are shocking. This needs needs to change. ‪#‎ItsOurTime‬ for educating the medical world, to ensure symptoms will be recognized sooner and diagnosis is no longer not such a battle to receive. The Ehlers-Danlos Society is dedicated to nothing less than a total transformation of our understanding of Ehlers-Danlos and the mechanisms by which it causes so much pain. 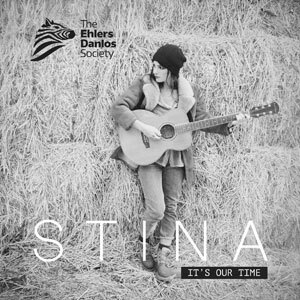 Stina has recently recorded a charity single for The Ehlers-Danlos Society, the International charity raising funds and awareness for the genetic condition Ehlers-Danlos Syndrome, which is due for release in May. Her sound is likened to a diverse mix of Damien Rice, Mumford & Sons, Lily Allen and Kate Bush; with her haunting arrangements, folky melodies, quirky lyrics and rich floating vocal. Stina’s classical training and background is evident in this delivery and vibe, bringing something fresh and excitng to a blend of lyrical ballad and quirky new age folk. Stina studied cello at the Royal College of Music and is now undertaking a Masters in Performance at Mountview Academy of Theatre Arts, specialising in Musical Theatre. Dubbed as a septuple threat, Stina is also a composer/arranger, writer, dancer and actor in addition to being a singer, songwriter and multi-instrumentalist/musician.